If you follow Swing for Kids on Twitter, Instagram, or Pinterest (which you should! 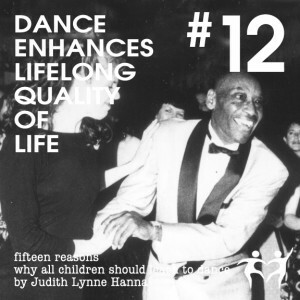 ), you've seen our recent posts about Judith Lynne Hanna's "15 Reasons that All Children Should Learn to Dance" originally published in her 1999 book, Partnering Dance and Education. Over the past four decades, Hanna has been conducting research on dance education in urban areas and the meaning of dance in villages and cities in Africa, and theaters, school playgrounds, and classrooms around the world. Hanna's research strongly supports the need for dance education in public schools, which is something Swing for Kids believes in whole-heartedly. In this post, we'll take Hanna's 15 reason's that all children should learn to dance and put a Swing for Kids spin on it. Enjoy! Like any other dance, Swing Dance takes balance and coordination. Swing Dance is also an energetic and athletic dance that helps kids move during the school day. Movement has been shown by educational, cognitive, psychological, medical, and behavioral research to be one of the best ways to get all children engaged in learning. Self-expression, improvisation, and communication between the lead and the follow is what makes Swing Dance so much fun. Dancers are continually responding to the music and each other, offering up their own ideas through movement, body language, and facial expressions. Jazz is an American art form that stays alive through the practice of Swing Dance. Swing Dancers aren't just avid dancers, but are Jazz enthusiasts. It's not just about the dance, it's the history, culture, music, and fashion of the era. Swing is an American art form with roots in African rhythms and African American history and culture. You can't learn the dance without the history permeating through every lesson, dance, and event you attend. Because Swing is a social dance, participants continually make decisions based on the music and their partner in the moment. The "rules" of Swing Dance are broad enough that the dancers are free to improvise, try new things, and react to their partner, body position, and location on the dance floor. Students are encouraged to try new ideas and moves without sticking to a prescribed sequence. Similar to Reason #4, the social aspect of Swing Dance makes the combination of moves nearly endless. When a lead decides to initiate a certain move, they have no way of knowing exactly how the follow will respond. There really is no "right way" to lead or follow, but multiple ways to react in certain situations that allow each partner to respond in their own way, with their own personality. One of the social and emotional competencies that the Swing for Kids curriculum addresses is "Relationship Skills." In order to learn Swing Dance, kids also have to learn not only how to convey the spirit of the dance with their own body language and facial expressions, but also how their body movement, eye contact, and nonverbal language effects their partner. When watching vintage swing dancers like Whitey's Lindy Hoppers, Hal Takier, Al Minns, Pepsi Bethel and Leon James, kids are able to analyze and judge how their own body movement matches that of vintage dancers. They are also able to compare the different ways the body moves and feels when doing Charleston, Tap, Swing, and Hip Hop. Dance has always been away for cultures around the world to communicate, celebrate, and express their own morals and traditions. Swing for Kids' unique programs ties Jazz and Swing dancing to it's roots in African dance and points out the influences these dance forms have on modern hip hop. 9) Through stimulating all the senses, dance goes beyond verbal language in engaging dancers and promoting the development of multi-sensory beings. When engaging in a social dance like Swing, students begin to understand the value of all of their senses. Communicating with your partner during a dance requires the use of hearing, sight, and touch. Subtle changes in the tension of the arms or position of the body can completely change the feel of the dance and reaction from a partner. Much of Hanna's research was completed in low income, urban areas. Many of the students participating in these school dance programs benefited not only from the physical, social, and emotional aspects of learning to dance, but also gave them a place they felt welcome and a stronger connection to their school and teachers, leading to higher engagement, better attendance, and improved academic success. Dance programs in schools have the potential to open up a new world of job opportunities to the students who participate. Kids begin to see dance not only as a form of recreation, but a serious field of study and career path. Swing for Kids is supported by a national community of swing dancers, many of whom make a living teaching and performing dance. These role models show students that an alternative to a more traditional career path is available to them. Dance, in general, has been proven to improve heart and lung health, balance, posture, muscle tone, and bone strength. Both solo and social dancing have been shown as significant stress reducers as well as improve cognitive functions in both kids and adults. Members of dance communities like Swing, Ballroom, or Salsa also report increased happiness and satisfaction with their social lives. The presence of dance communities in cities not only benefits the dancers themselves, but also the local businesses in those communities. Dance communities support their local venues, musicians, vendors, and clothing stores on a regular basis. The moment kids see a group of live Swing Dancers they notice how energetic and athletic the dance is. The Swing for Kids' curriculum keeps kids moving and engaged and provides much needed blood flow, stress relief, and fun during the school day. 15) Dance education contributes to the National Education Goals. Strong evidence & research supports that incorporating subjects like art, music, theater, and dance into the school day lead to more positive student outcomes both socially and academically. In 1999 when Hanna conducted her research, dance education helped schools meet National Education Goal #3. In 2015, the "Every Child Achieves Act" named the arts a core subject in public schools, so this reason still holds true today. As you can see, we think dance education and Swing for Kids can do some pretty great things in schools! This is why it is so important that we expand our reach to more and more kids each school year. You can help by spreading the word about Swing for Kids to schools, families, foundations, donors, and dancers you know. Every single like, share, mention, and donation makes a difference. With your help, we can inspire and empower Chicago kids to do great things!